Despite some negative press, zombie survival sim The War Z has launched on Steam and gone straight to the top of the best-sellers charts. So it's curious timing that, on the same day the game was hitting those lofty heights, developers Hammerpoint Interactive released an update. Which introduced a new "feature". 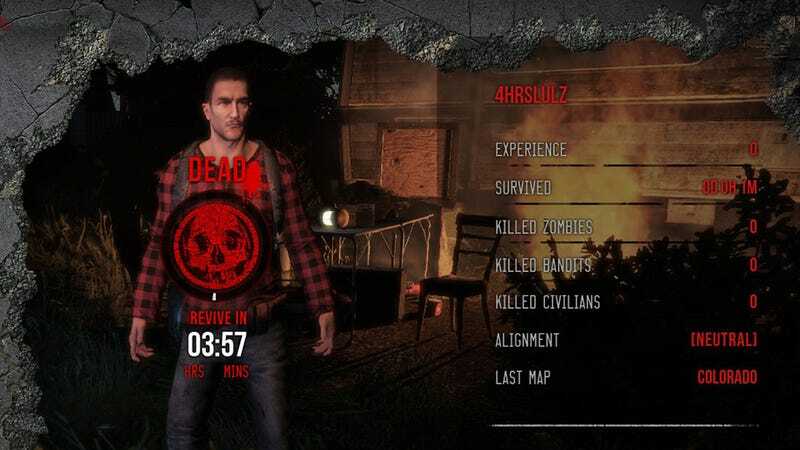 Previously, including on the day of the game's launch, a dead character (you can have up to five) would have to wait 60 minutes before they could respawn. Tough, but it's a tough game. Now, since the patch, your respawn time is four hours. Sounds insane, and it is, but to get around it, Hammerpoint also brought in a glowing green button that lets you respawn instantly. Provided you pay. Real money. Each respawn costs the player 50GC, or "gold coins", a form of in-game currency that equates to around $0.40 per use. While GC can be found in the game world, there's obviously not enough to sustain regular use for transactions like this. Throw in the fact GC is, like Microsoft Points, only available in block purchases (with a minimum spend of $5), and you can see how the money will be coming in. And also where the problem is. WarZ isn't a free-to-play title, or a cheap iPhone game, it's a retail product that people have already paid at least $15 for (there are more expensive bundles available that come with in-game currency). Now, on the very day it hits some unexpected sales success, a patch brings in a fundamental form of microtransaction? A cynical man would say the two might just be related. Understandably, there's already an uproar, with a Reddit thread criticising the move, as well as numerous threads on the game's official forums, including a poll of hundreds of players that votes overwhelmingly against the change. Some fans are saying it's not that big a deal, pointing out that since you have five character slots you can cycle through them. There's also the fact the game has many other forms of microtransactions, most related to items and gear. The counter to that, of course, is that this introduces a "pay to win" element to the game, where those coughing up for instant respawns can improve their characters at a faster rate, something you shouldn't have to contend with in a retail product, especially one that's already so full of griefers as WarZ is (my first two deaths in the game, like the one above, were from human snipers).